LOCATION.--Lat 41`16'25", long 77`19'28", Lycoming County, Hydrologic Unit 02050205, on left bank on State Highway 44, on abutment of abandoned bridge 0.9 mi downstream from Ramsey Run, 4.0 mi downstream from Little Pine Creek, 4.0 mi south of Waterville, and 9.2 mi upstream from mouth. GAGE.--Water-stage recorder, crest-stage gage, and water-quality monitor. Datum of gage is 570.62 ft above National Geodetic Vertical Datum of 1929. 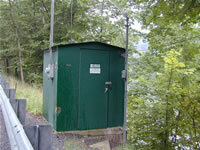 Prior to June 16, 1982, non-recording gage at same site and datum. Satellite and landline telemetry at station.